Wearing braces isn't just for teenagers — straightening teeth can be just as viable a need when you're an adult. For example, it may be necessary to first move teeth away from an empty tooth socket before you obtain a dental implant or other restoration. But braces could have complications, especially if you have periodontal (gum) disease. These infections caused by plaque, a thin film of bacteria and food particles, inflame and weaken gum tissues and erode supporting bone. It can be treated and brought under control — but keeping it under control requires daily brushing and flossing, along with frequent office cleanings and checkups. Braces can make this more difficult: it's harder to brush and floss effectively through the hardware of brackets and wires, which can give plaque a chance to build up. Patients susceptible to gum disease are more likely to have re-infections while wearing braces. The hardware can also cause enamel to come in prolonged contact with acid, which can dissolve its mineral content and open the door to tooth decay. Clear aligners are an alternative to braces that can accomplish tooth movement while minimizing infection flare-ups for people with gum disease. 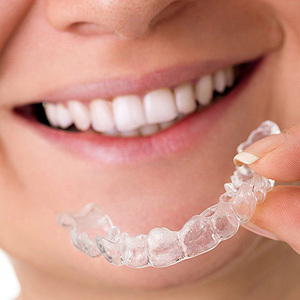 Aligners are a series of customized clear plastic trays worn over the teeth, with each succeeding tray incrementally moving the teeth further than the preceding one. After wearing one tray for a specified time period, you then switch to the next tray. The teeth gradually move to the desired new position over the course of the aligner series. This option is especially advantageous for gum disease patients because the trays can be removed temporarily for brushing and flossing. There are also other benefits: we can hide a missing tooth space with a temporary false tooth attached to the aligner; and, they're nearly invisible so it won't be obvious to others you're undergoing orthodontic treatment. Not all orthodontic situations benefit from this alternative, while some cases may call for a combination approach between aligners and braces. But in the right setting, clear aligners are a good choice for not only obtaining better teeth position, but also helping you avoid a new encounter with dental disease. If you would like more information on orthodontic treatments for adult teeth, please contact us or schedule an appointment for a consultation.